As you can see, my painting still needs a LOT of work. While I've been trying to put some tips from Stephen and Jeff into practice, my clumsy hands need much more practice. So very bad. 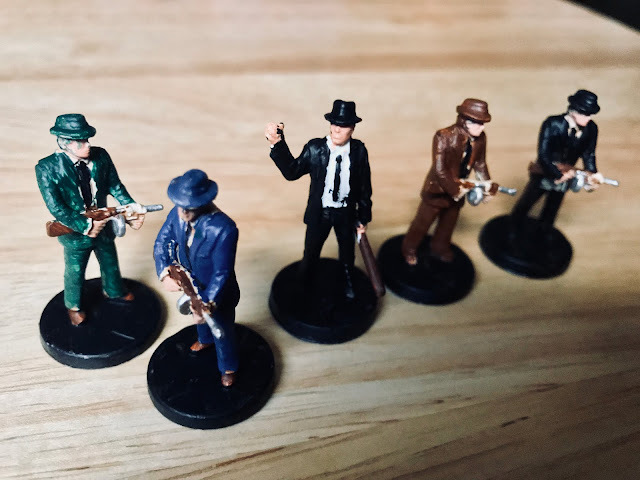 These are board game figurines for use with Fortune and Glory, in which players take on the role of adventurers trying to save the world while enjoying Republic serial-style cliffhanger escapades. I'm painting the included miniatures in an effort to make the game more immersive. As it stands, I'm afraid my lumbering incompetence may prove more of a distraction than anything, but we'll see how it goes. It's good to try something new, even if (perhaps especially if) it's outside my core strengths. Labels: art, Board Games, Fortune and Glory, Jeff S., Painting, Stephen F.
I dunno what you are talking about,these guys look BOSS! Remember, these plastic figs have waaaay less detail than metal or resin ones. And the more you paint, the better youare going to get. Well done, sir; can't wait to play this again! You're far too kind, but I appreciate the encouragement!